Everyone remembers Tamogotchis. While they offered no real purpose beyond tickling my latent need to organize and nurture a needlessly intricate system, they did a pretty good job of holding my attention. For a time, at least: you could only optimize those feeding and care cycles for so long before realizing you’re kind of spinning your wheels, having long since run out of things to do. I run into the same problem with most Nimblebit games. Pocket Trains and Pocket Planes push all the right buttons, but once you’ve constructed a transportation empire that spans a few nations you start to realize that pushing any further means doing much of the same, only on a larger scale. Tiny Tower was always the worst offender. Build commercial spaces to raise funds. Use those funds to build residential spaces, attracting new residents who’ll staff your commercial spaces. Rinse and repeat until pressing the button that’ll raise and lower the elevator to dizzying heights becomes too onerous—then you delete the app and find something else to kill time with. So. 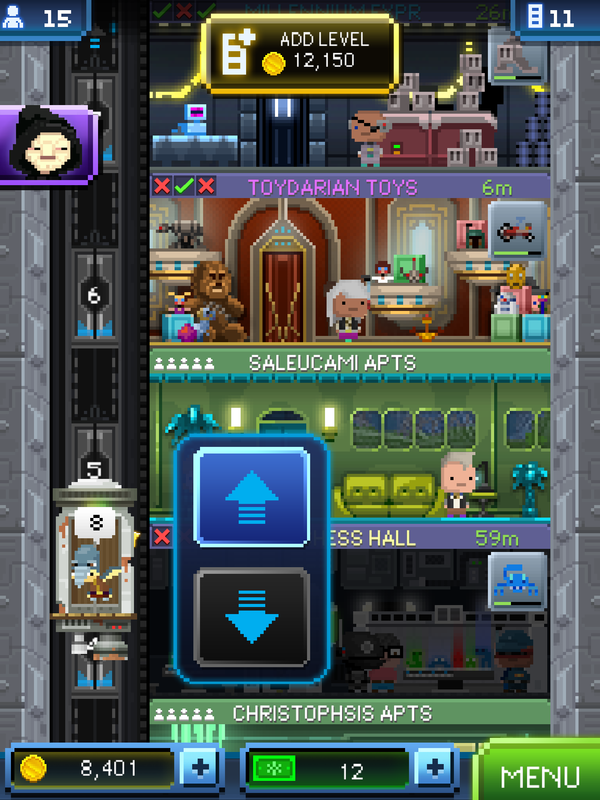 Tiny Death Star. I can’t tell you what the allure is here, as I see things playing out in much the same way. The game is deceptively hands-on, which is something of a double-edged sword. The "action" again revolves around keeping commercial spaces stocked with supplies for patrons to purchase: this time, Emperor Palpatine and Darth Vader are opening up commercial outlets to fund the construction of the Death Star. Stocking goods in the first few shops will only take a few minutes, but that'll quickly climb to over an hour as you add outlets to your fledgling space station. You can always spend Imperial Bux to speed things along; they're Tiny Death Star's alternate currency, and can be earned for completing random objectives or forking over real cash. Or, you can roll up your sleeves and get to babysitting. Toy stores on the Death Star? That trench run suddenly seems less noble. 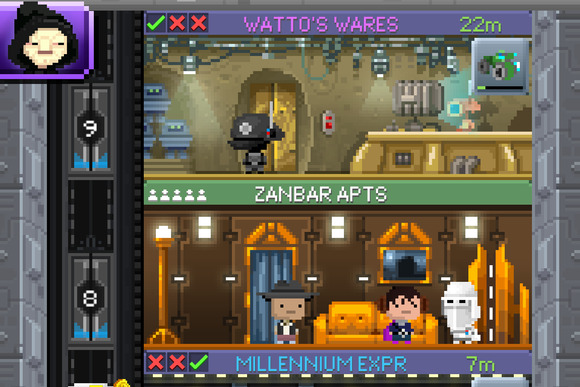 Manning the elevator was always the most infuriatingly intriguing part of Tiny Tower, and tiny Death Star is no different. Visitors to the Death Star show up at random and request a random floor; you push and hold the up button on the elevator until it reaches their destination, at which point your awarded with a paltry tip in gold coins. The real rewards involve a bit of luck: If a visitor requests a floor that happens to be a residential space, and there's space available to rent, they'll move in. Residents will operate your shops, stocking the shelves and selling wares. But more importantly, if a visitor requests a floor that hosts a shop that's currently stocking something, they'll shave sixty seconds off of the time you're waiting for those goods to be prepared. And that's how they get you. When you have a few minutes to kill, there comes that nagging realization that you could be giving your Death Star's hourly earnings a healthy bump by staring at adorable pixel people and pushing a button. Better (or worse?) still, manning the elevator is the only way to see everything the game has to offer, in the form of VIP visitors that can give you rare rewards and power ups, or trigger comical little cutscenes for you to collect. VIPs will also operate the Death Star's Imperial Rooms, tinkering away at side projects you can cash in for rewards. And that's it, really. The Emperor will always have a mission available—generally ordering you to build a particular type of floor—but you're ultimately left to your own devices, expanding the Death Star as you see fit. I'd argue that there isn't much "game" here in the traditional sense, but I've already spent more hours over the last few days than I'd care to admit, sipping watered-down drinks in airport lounges and shuttling pixel people up and down, up and down. If my Tiny Tower experience is any indication, I’ll be at this for some time yet. This story, "Tiny Death Star: Return of the routine" was originally published by TechHive.